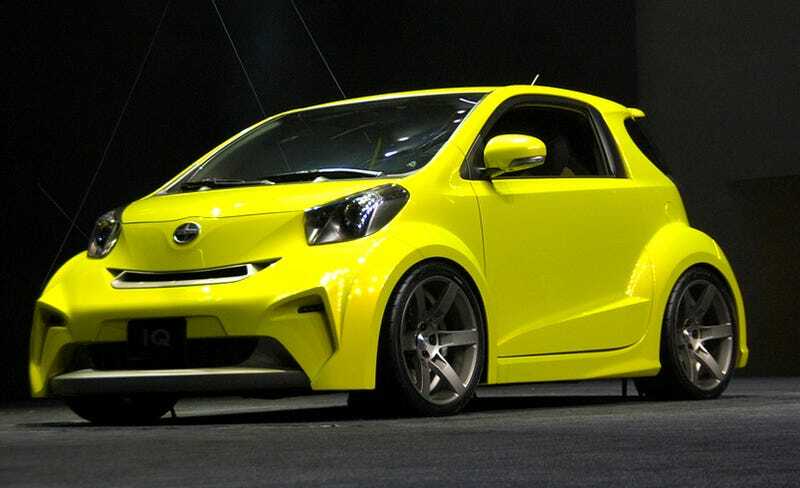 Based on the Toyota iQ, the creatively named Scion iQ Concept is over two-feet shorter than a typical subcompact. Scion calls it "Fierce." You tell 'em Tyra. Scion also calls the paint color "radioactive" and describes the interior as "3+1." Power comes from a 93 HP 3-cylinder engine modified with a custom exhaust from Five Axis, along with a series of suspension and wheel upgrades. Scion says it will gauge response to the concept and possibly put it into production. Scion's iQ concept is a new urban vehicle with a revolutionary package that is just over 10 feet in length and accommodates three plus luggage. As more and more urban centers are revitalized with a new sense of purpose, energy, and creativity, young people are moving in from the suburbs to embrace new urbanism and are looking for a car that suits their needs and delivers high emotional value. Scion's iQ concept is the intelligent answer to this need for highly emotional and efficient urban transportation. The convenience of having work, entertainment and culture nearby for young city-dwellers is a significant draw to urban centers. The vehicle must be able to navigate narrow, congested streets, park in tight places, have impressive fuel economy, and have compelling design and function. "Scion's iQ concept turns traditional auto design upside down," said Jack Hollis, Scion vice president. "Traditionally small vehicles have been thought of as being basic. The iQ concept is just the opposite with its innovative features and iconic urban design, and we believe it fits in well within the Scion brand. Our young, trendsetting buyers are creative and innovative forward thinkers, and we think they will appreciate what iQ has to offer." The production iQ is currently sold in Japan and Europe. Five Axis of Huntington Beach, Calif. took the iQ to the next level with aggressive exterior and interior modifications that show the vehicle's potential for personalization. Pushing the wheels of the small, bold concept towards the four corners of the body gives the iQ a confident stance. The custom 18-inch wheels with a nickel finish and wide tires fill the wheel well, adding to its surefootedness. The iQ's custom front air dam, aero headlamps and high-intensity LED driving lamps signal urban road readiness. "We believe the Scion iQ micro-subcompact concept is the future of transportation," said Hollis. "If it should join our future line-up, I think it could reach iconic status like our xB. Its styling will attract attention and if it's a Scion, you know it'll be easy to personalize." The iQ's profile is defined by a strong and high beltline. Smooth lines glide from the large, dark finish headlamps, up the A-pillar, across the roof and wrap around the rear emphasizing the concept's geometric beauty. Side mirrors with integrated turn signals accent the clean design. The rear emphasizes the vehicle's modern style. Trapezoidal lines run toward the wheels, from the hatch to the thick rear diffuser, creating a substantial presence. A center-mounted trapezoid exhaust adds to the vehicle's distinctiveness, while large, matte-finished rear taillights help keep the vehicle visible. The iQ's interior fuses function, style and entertainment. Attention to detail and modern accents can be seen in the illuminated door handle; the swiveling spotlight that hovers over the dash; an illuminated iQ logo on the passenger-side dash and nickel and raw aluminum toned interior panels. Iridescent green and gray honeycomb upholstery covering the door panels and seating areas, combined with the custom exterior paint, provides a balance of freshness and sophistication. Black matte scuba-like polyurethane covers the seat bolsters and is also used on the headliner with a bright green topstitch for a contemporary finish. The iQ does not skimp on safety and is equipped with Vehicle Stability Control (VSC); an anti-lock brake system (ABS) with Electronic Brake force Distribution (EBD); Brake Assist (BA); and nine SRS airbags, which includes the world's first rear window curtain airbag. Other airbags include driver and front passenger front airbags; driver and front passenger seat-mounted side airbags; side curtain airbags; a driver knee airbag; and a front passenger seat cushion airbag.